Tile puzzles never really get a lot of glory. They’re a staple of the gaming world, usually popping up as light filler in more complex games, but tile puzzles are typically more annoying than anything else. Either you’re stuck sliding pieces around to make a stupid picture or you’re doing a rather lame jigsaw puzzle. Either way, they don’t usually offer a lot of challenge, so how do you jazz them up? You make ’em move. 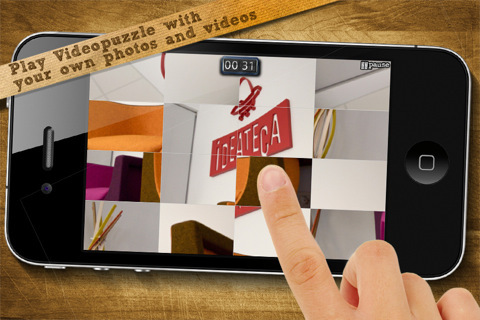 Simply put, Video Puzzle takes video clips and turns them into simple tile-swapping puzzles. You get a short glimpse of the assembled screen before it gets broken up into interchangeable tiles, but the video keeps on playing, even after it’s been shattered into pieces. You drag to swap pieces, and tap to mirror image them if they’ve been shuffled around. Jumping from a static image to a video clip doesn’t seem like a huge innovation for jigsaw puzzles, but you’d be surprised at how much it ramps up the difficulty level. Ordinarily, solving a 15-piece jigsaw puzzle isn’t much of a challenge, but it becomes a lot tougher when each piece is constantly changing before your very eyes. In addition to the basic pre-assembled puzzles in Arcade Mode, Video Puzzle also gives you the ability to make your own puzzles. You can select your own photos or video clips to use, or you can even fire up your camera and try to assemble a video puzzle as it’s being shot in real-time. Given the near infinite replay value of the game, it’s an interesting concept, but the execution leaves a bit to be desired. For one, the videos they’ve included aren’t particularly interesting, and a few suffer from weird lighting, awkward transitions, or just don’t include enough movement to tell what’s a match and what isn’t. I was stuck for ages on one puzzle because I couldn’t tell if the blank wall on the side was correctly oriented or not. Unfortunately, the sound is absolutely awful. Irritated to the point of muting my phone by the atrociously repetitive background “music”, I made the unfortunate discovery of a bug that causes the sound to play even when the phone is silenced. Very, very annoying. For the most part, it’s not a terrible app, and it’s innovative in its own way, but there isn’t a lot of content to really make it fun. Although the developers have included hopeful messages promising future levels, as the app stands currently, it just doesn’t offer a lot. There are a number of difficulty levels to challenge you with, but most of the time, it just takes videos you’ve already seen and breaks it up into more pieces. Of course, if you make your own videos, you’ll get as much mileage as you want from the app, but if it’s a long video, expect to wait a long time for the file to compress. Bottom line: it’s a neat idea, but it needs a little more polish. 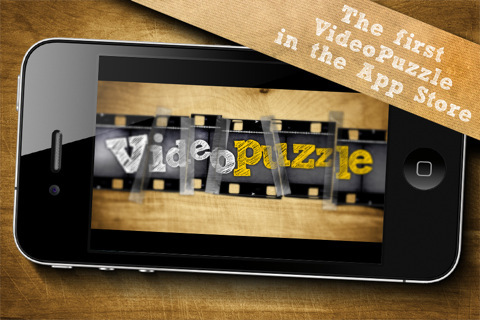 AppSafari review of Video Puzzle! was written by Tracy Yonemoto on February 28th, 2011 and categorized under App Store, Games, Puzzler, Video. Page viewed 4399 times, 2 so far today. Need help on using these apps? Please read the Help Page.